I'm back from raining Hastings to find there's some Halo Reach goodness floating round the ether. Here's some round up. Question: "Hey! Why do the members of Noble Team have higher ranks than the other Spartans I’m familiar with, like the Master Chief?" Answer: As NOBLE tends to operate much more closely with non-augmented personnel than Blue, Red, et al ever did, NOBLE's CO decided that his team shouldn't have to worry about some Oscar Sierra light-switch they might run into in the field trying to start calling the shots or otherwise alter OP parameters mid-mission. So wise that CO, Carter. Frank O’Connor: It is…I hate the use of the word “gritty,” because it sounds like shorthand for Gears of War , and it’s nothing like that. It’s definitely darker in tone; it’s a very tragic story to begin with. I mean, we talked about it as a kind of Thermopylae/Pearl Harbor scenario, where we know that everything’s gonna go wrong, but at what cost—and what acts of heroism define that cost? In the same interview Frankie confirmed some good news following this question TeamXbox: “What new Halo reading material is coming—books, comics, etc. ?” There’s certainly some things we’d like to go back and do. One of the most commonly-requested things is we want to find out what happened to the guys from “Ghosts of Onyx.” I can probably say that you will find out what happened to the guys from “Ghosts of Onyx.” I swear on my…life that you’ll find out. 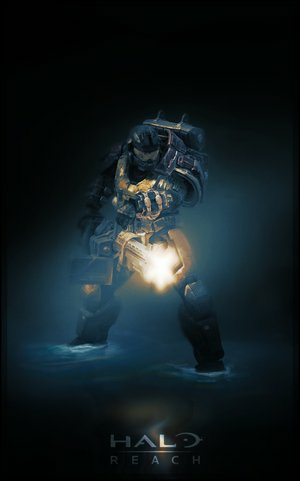 Game Informer also has some new Reach Wallpaper. Also why not check out the new iphone wallpaper.